Do you wish you could make your own cappuccinos and lattes at home? With a gadget that’s becoming more and more popular, you can create frothy hot and cold beverages quickly and easily. Having your own milk frother will help you turn an ordinary cup of coffee, hot chocolate or matcha tea into something special. However, with all the milk frothers on the market today, I can see why one might be a bit confused over which one to buy. 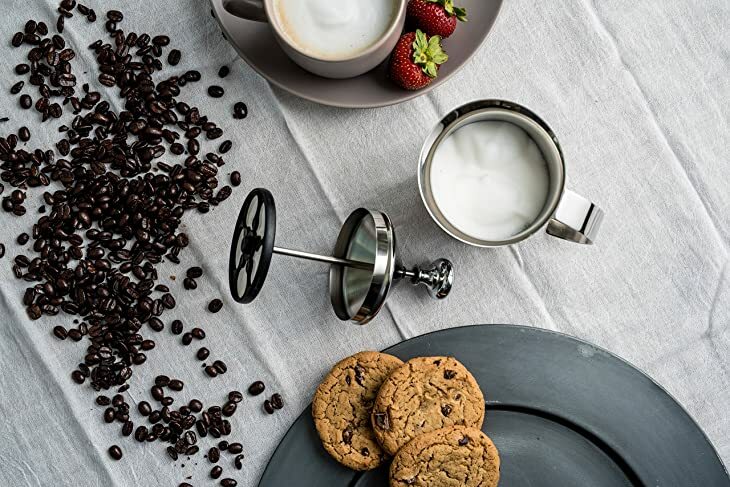 From handheld and battery-operated milk frothers to small electric appliances that will both heat and froth your milk for you, the best milk frother is waiting for you, so let’s go! Before we actually get started with reviewing five of the top milk frothers out there, I want to give you some basic information about these gadgets, including all the things they can do and the various grades available. My goal is to help you narrow down your search among hundreds of milk frothers to help you purchase the best one for your needs. While some milk frothers have the ability to steam your milk, you can get one of these magical gadgets to simply do one thing: create tantalizing milky foam. 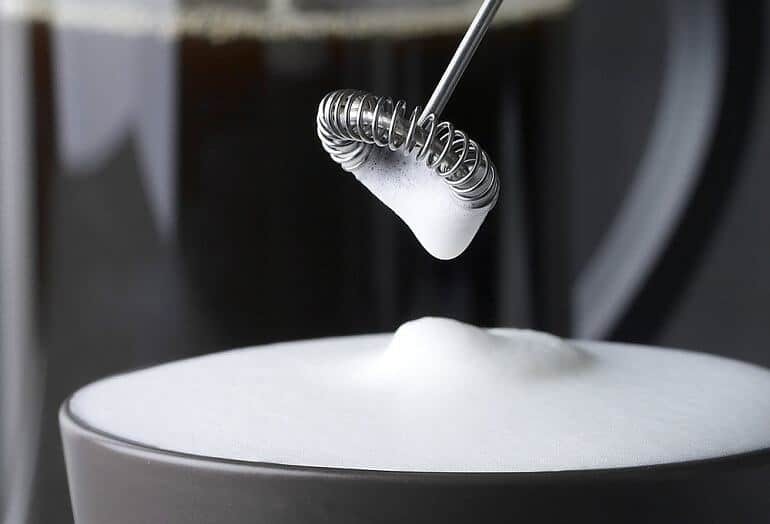 Milk frothers basically work by filling a part of your milk with air bubbles that become firm enough to settle on top of your coffee drinks. These gadgets can also beautifully and evenly mix your powdered matcha into the liquid of your choice, resulting in the perfect cup of tea or chai tea latte. Some frothers operate at the push of a button while others can be held in your hand. The video below will show you how a handheld milk frother works, or you can learn how to make matcha latte with a handheld frother in this video. 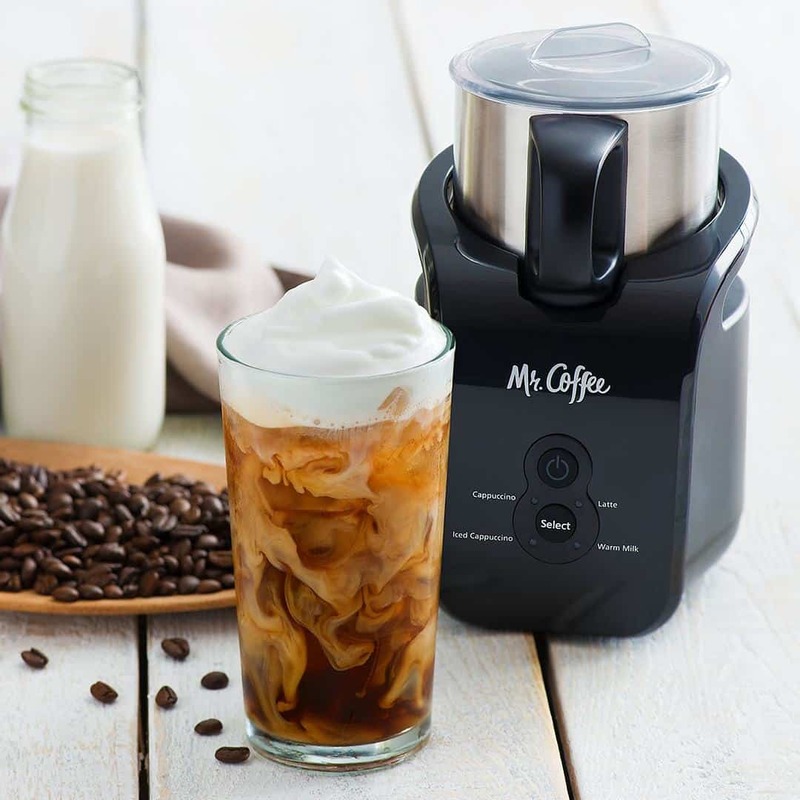 If you really like to make your own cappuccinos, espressos and lattes, you might opt for a milk frother machine that can also produce these delicious beverages or a specialty coffee machine that has this feature on the side. These machines are expensive but are smartly designed to give you exactly what you want at the touch of a button. In addition, there is a large variety of milk frothers that resemble small pitchers and come in plastic﻿﻿, me﻿t﻿﻿a﻿﻿﻿l or stainless﻿﻿ ste﻿﻿el﻿﻿﻿.﻿ You can find them in high and low price ranges. They are quite easy to use and take only minutes to create a delightful cup of frothy milk. The most affordable milk frothers I have found are those that are handheld and work with batteries. Some are small enough to store away in a kitchen drawer or cupboard while others include a stand that lets them sit on kitchen countertops. These can froth your milk in a matter of minutes and are under $20. The grade of milk frother you purchase should largely be based on how often you’ll use it. If you use it occasionally or even daily to make yourself a cup of coffee, a handheld milk frother might be all you need. If you want to regularly use it for several people, such as family members, friends or guests, you might benefit from an automatic milk frother. Don’t expect long life from some of the lower priced handheld milk frothing gadgets. The casing may not be the best quality, either. Remember, you get what you pay for. Therefore, you may be better off with the stainless steel type. Besides being very durable, a stainless steel milk frother will probably complement your kitchen with its contemporary style. An automatic milk frother will not only create perfect hot or cold milk froth but also keep it at the temperature you select. As a result, you’ll have plenty on hand for as many servings as you need, and when you run out, all you have to do is pour in your milk and press a button. 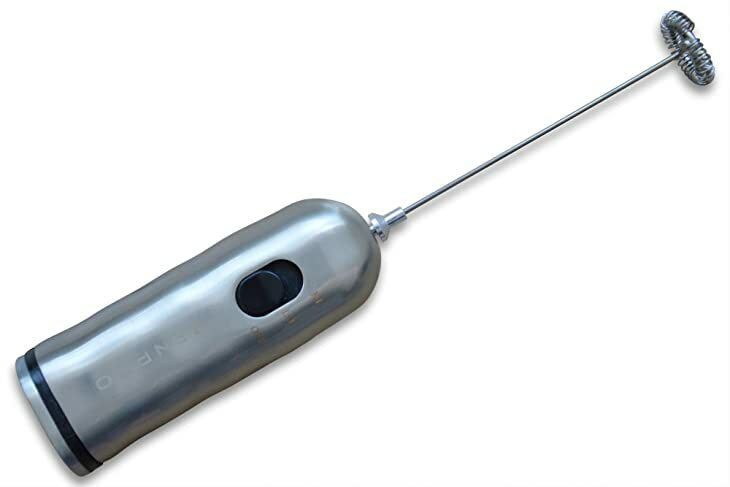 Moreover, if you want a long-lasting milk frother, I have read a few reviewers state that the nonstick material of some of the metal milk frothers tends to wear off after a while. Another consideration is how much cleaning is involved in the milk frother you choose. If it comes with various parts you have to disassemble to clean, you may find this troublesome. In this regard, portable and handheld milk frothers are extremely easy to clean. All you have to do is stick the whisking head in hot, soapy water while it is running and then rinse it in clear water. However, most milk frother machines are pretty easy to clean as long as you tend to them right away and don’t allow the milk to dry. 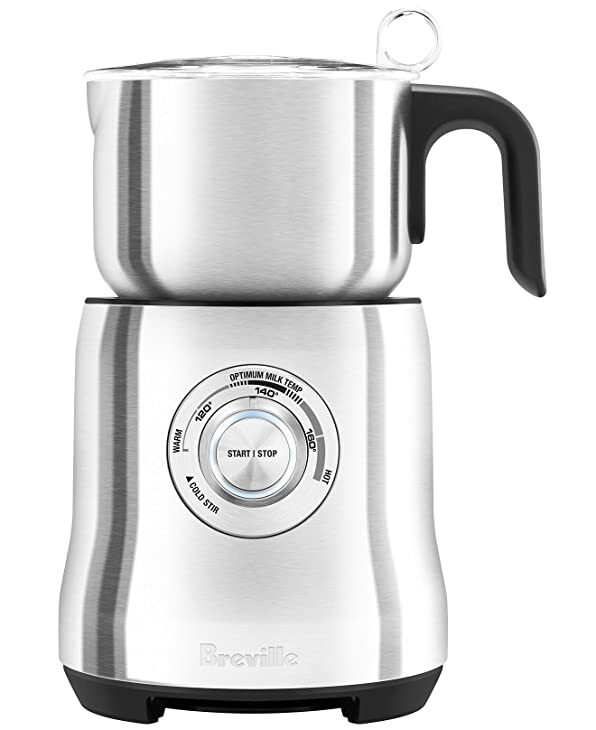 When I saw the Breville milk café milk frother, I was impressed with its sleek, contemporary design and outstanding features. It has a great temperature control dial that starts at a cold stir and goes up to 160 degrees. Once it reaches the temperature you choose, the frothing automatically stops. It'll also do cold frothing and holds up to 3 cups of liquid. I was also impressed with the fact that it comes with different frothing discs, including one that creates smooth and silky milk for your lattes and another that froths your milk to a creamy and thick texture for cappuccinos. You can add chocolate syrup, flakes or powder to the milk as it’s warming. In addition, cleanup is quick and convenient because the stainless steel mug and the parts can be placed in your dishwasher. 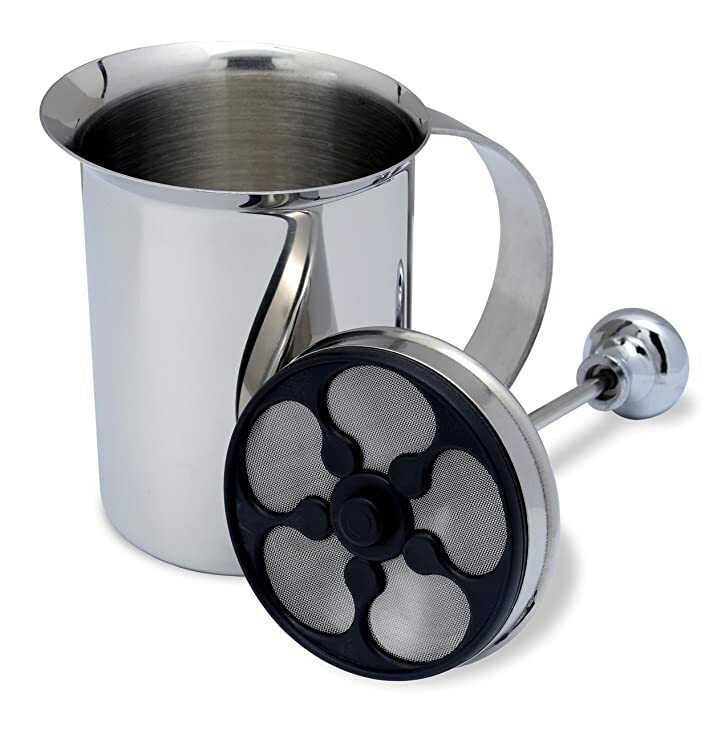 This portable and handheld milk frother by Zenpro is made of stainless steel and has two speeds. It produces a lot of power to whip up milk in just 10 seconds, yet it has a low-sounding motor. It even works well with cold milk. Moreover, it is lightweight and a great space saver. 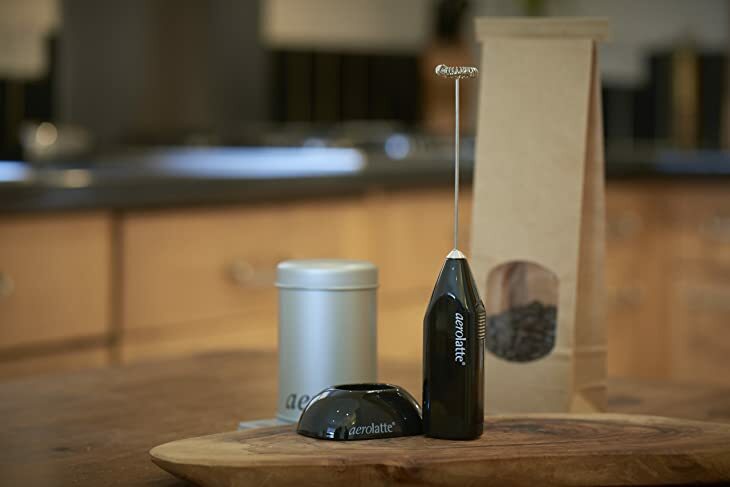 With this little gadget, it is very easy to make those beverages you and your family enjoy. Plus, because this milk frother is priced low, you can afford to serve your family members and friends all the cappuccinos and lattes they want. It runs off two AA batteries. Although the Bellemain hand pump milk frother is pretty small and only froths enough milk for 1 cup of coffee at a time, it has some great features that other milk frothers don’t have. One of those features is that it works manually, so you can take it with you when you travel, go to work or head out on a camping trip. Similarly, this durable gadget takes only seconds to produce perfectly frothed milk and is completely dishwasher safe. If you’re looking for an affordable milk frother that works great with nondairy milks, this is a good choice. It comes with a two-year warranty. 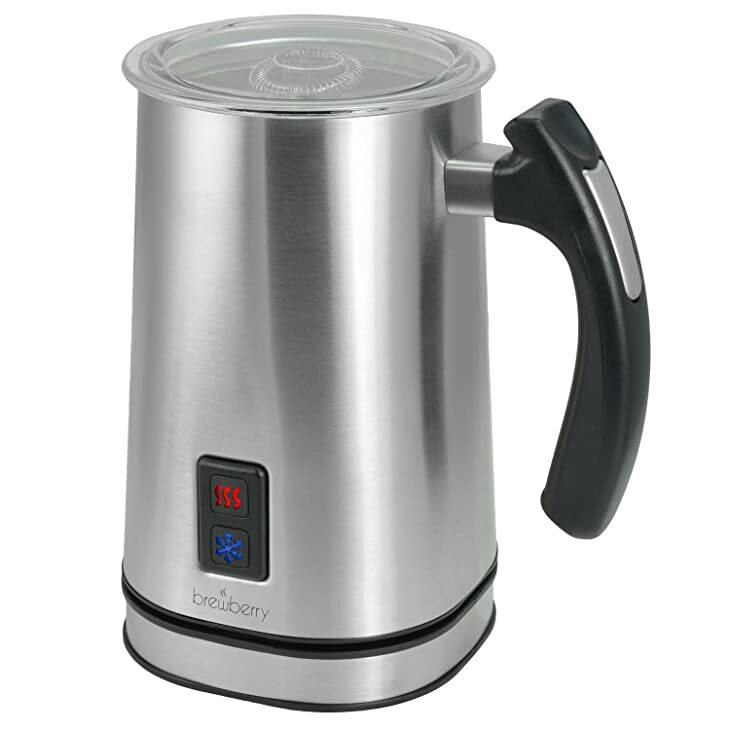 This milk frother by Brewberry is unique in that it can froth hot or cold milk, which other brands similar to this one cannot. Another good feature is that it allows you to heat with a small amount of froth. This is especially nice if you need to use it only for yourself. The fact that it is crafted in stainless steel makes it all the more attractive because this material is durable and will likely look great sitting on your countertop. Moreover, this milk frother has a nonstick interior coating, which means it is super easy to clean. The nifty see-through plastic lid and 32-inch electric cord are extra nice touches. I also like the fact that it’s backed by a two-year warranty. If you want a small, lightweight and attractive milk frother, check out the Aerolatte hand-held milk frother. It comes with a convenient stand, so it will sit on your countertop ready for you to use at your convenience. Additionally, since it is available in a rainbow of bright colors, you can choose the one that best matches your kitchen. The colors include red, blue, white, ivory, black and pink. 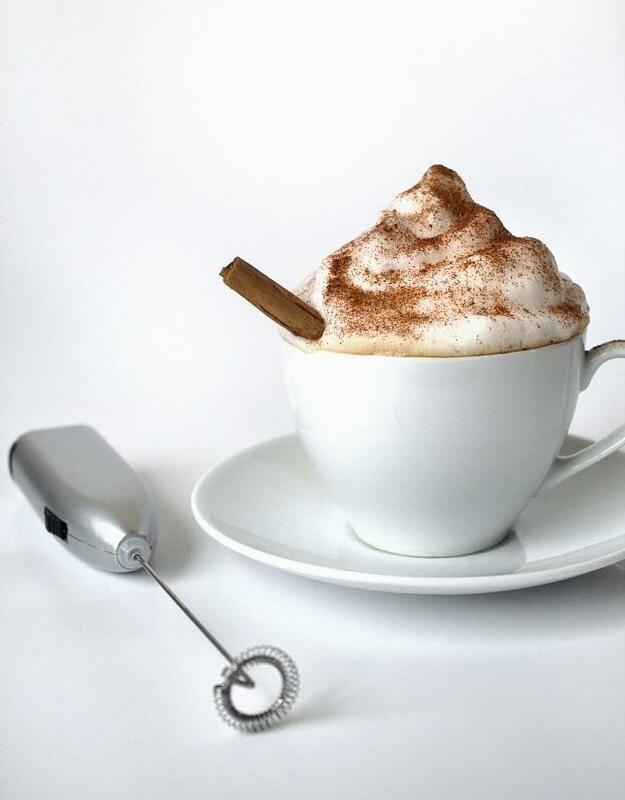 The Aerolatte milk frother makes perfect frothy milk in as little as 20 seconds or less. It's also very durable because it is made of food-approved 18/8 stainless steel and high-quality components, and it's backed by a two-year guarantee. Surprisingly, it comes with 2 preinstalled AA batteries, but you should have more on hand because several reviewers have stated that these batteries don’t last long. 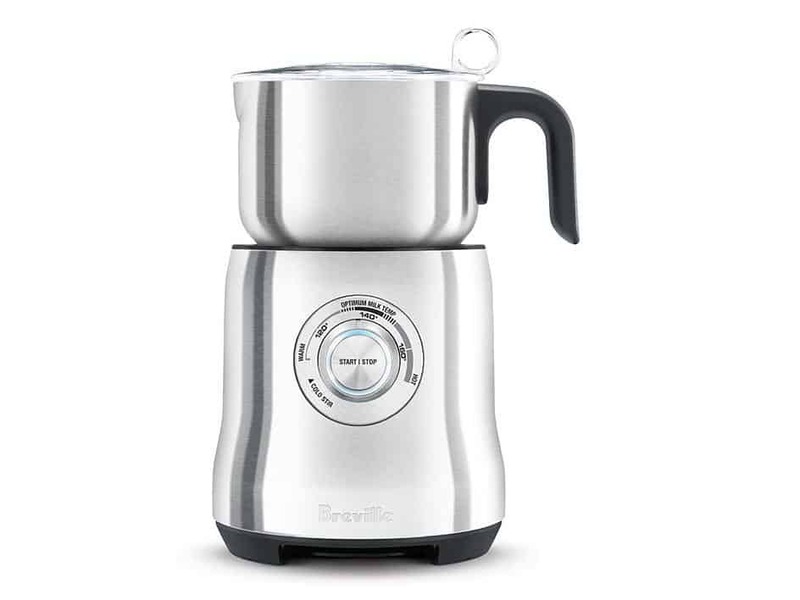 While all of these milk frothers carry great features, the one that I think has the best features is the Breville milk frother. When comparing it with the other frothers, I like it best because it promises to get your milk the exact temperature you want in minutes, and it also perfectly froths milk. It’s also dishwasher safe, so there is no messy cleanup, and it is big enough to make several servings for you and others. The only drawback is it won’t work for nondairy milks. Furthermore, while it is the most expensive milk frother in this review, I thought it was worth the price because it is made of stainless steel and comes with one-year warranty. If you enjoyed this review, please let me know your thoughts in the comments area. Also, please share this article with someone you think would benefit from it.